Dogs that snore in their sleep can cause fatigue and irritability in owners. Try these simple solutions to get the entire household back to restful sleep. What is better on a cold, rainy night than crawling in bed, snuggling under the blankets and cuddling your warm puppy? You drift asleep with the rain tapping the window and the gentle wheeze of your dog breathing. Suddenly, you hear snoring! The cozy moment is over. Why Does My Dog Snore When He Sleeps? Anything that breathes and sleeps can snore. 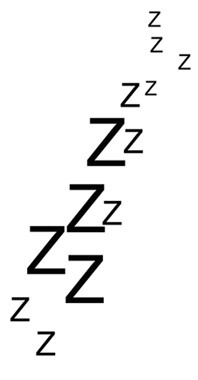 Snoring is the sound caused by the vibrations of respiratory systems moving air during sleep. Snoring is the result of an obstruction of the airway usually produced by the uvula and soft palate. 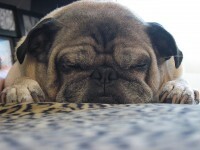 Smushed faces aside, breeds that are affected by genetics have little chance for corrections. Their snoring is created when the windpipe flattens, making it difficult to breath. 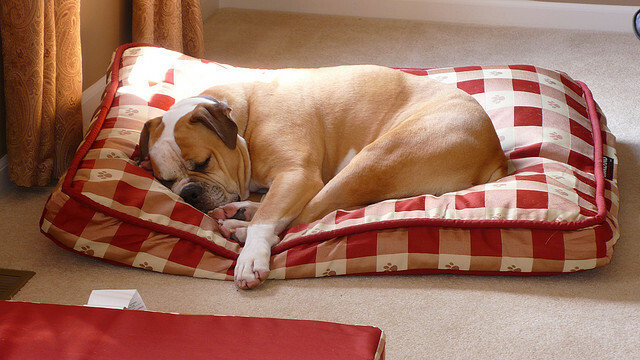 The dog will usually reposition during sleep in an effort to get more oxygen and self-correct his snoring issue. In extreme cases surgery may be necessary. If your dog is allergy-prone, the exposure to dust, pollen and smoke may contribute to the late-night buzzing serenade. Clean the pet’s bedding every day to remove dust and hair. Vacuum regularly to keep rugs and curtains dust-free. Walk your dog in the early morning and the late afternoon when pollen levels are at their lowest points and vehicle traffic is light. Remember that cigarette smoke is a chronic irritant to a dog’s sensitive nose. Digging in the dirt, rolling in the grass, even drinking water and eating can introduce foreign objects into your dog’s nasal passage, resulting in snoring. Extra mucus from a cold will also create snoring. For the most part, snoring caused by nasal obstructions is temporary and should stop when the passage is cleared. If the obstruction is caused by a growth such as a tumor or cyst, surgery may be required to prevent or cure chronic snoring in a dog. Dog snoring due to medication should be temporary and may be relieved when the drug is out of your pet’s system. Carrying a few extra pounds can result in snoring dogs, as well as (dare I say it?) people. Additional weight produces excess throat tissue. That extra flesh can create obstructions that blocks airways and make a sleeper snore. To get a good night’s sleep and to enjoy a much healthier lifestyle, lose weight. Practice a healthy diet and create an exercise program with your dog. You will both benefit from the effort. It is doubtful you would ever get your dog to tolerate one of the popular mechanical devices designed for human snoring intervention. Mouth guards and CPAP machines would end up as chew toys with my dogs. However, there are some tools that may offer relief to dogs suffering from snoring. Pillows. Giving your pooch a pillow may encourage him to raise his head during sleep. Round bed. This changes the sleeping posture, encouraging a curled position that allows air passages to expand. Humidifiers. They can provide extra moisture in the air, thereby reducing snoring. Change rooms. 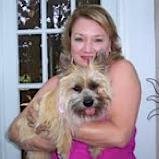 Moving the dog to a different room may remove some allergens that are causing the snoring. Recognize that curing or preventing snoring in a dog is a process. Don’t get impatient. Don’t wake your pet from sleep. Humans and animals are negatively affected by disturbed sleep patterns. It doesn’t take many sleepless nights to produce fatigue, grouchy, irritable moods and lack of concentration. A good night’s sleep is important to everyone’s overall health. If your dog’s snoring is unexpected or if it is affecting his — and your — quality of sleep, seek medical help. Chronic or sudden snoring, wheezing or rattling can indicate an underlying illness. With a little extra effort toward simple preventive solutions, you and your dog can cuddle into a long, peaceful slumber, regardless of the weather.